When Anna Kendrick said she wanted to be in a Squirrel Girl movie, no one thought it would really happen. And it isn't. But Marvel's most popular comic book character at the moment is getting her own TV show. Kind of. She will be the lead character in Freeform's upcoming adventure drama New Warriors. While Squirrel Girl was part of the original press release sent out by Marvel and Freeform to announce the show a few months ago, none of the other characters had been unveiled. Until now. Freeform has ordered 10 episodes of New Warriors for its first season. These will debut in 2018, and the search for Squirrel Girl is underway as we speak. Freeform has stated that they will approach both Anna Kendrick and Shannon Purser (otherwise known as Barb on Stranger Things) about taking on the lead role. Arrested Development and Parenthood star Mae Whitman has also thrown her hat in the ring, basically begging to land the role. 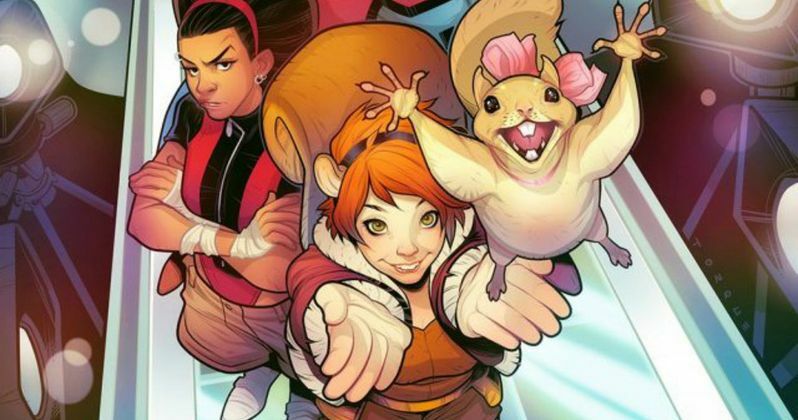 While we await news on who will become the first ever live action version of Squirrel Girl, we have a complete breakdown of the rest of the team, thanks to Marvel. New Warriors will follow six young people with extraordinary powers who decide to work and live together for the common good. Their special abilities are said to be on the polar side of the Avengers. These Millennials want to make a real difference in the world, while high-fiving themselves for any and all tasks, no matter how menial. As such, the world may not be ready for what they have in store. These guys aren't quite super, and they're not quite heroes. It is about the experience of becoming an adult, and the problems that arise from that. Marvel has provided a comic book image from the New Warriors to give fans an idea about what to expect. Clockwise from the top are Zack Smith (Microbe), Dwayne Taylor (Night Thrasher), Craig Hollis (Mister Immortal), Doreen Green (Squirrel Girl), Deborah Fields (Debrii) and Robbie Baldwin (Speedball). And now the breakdown. First up is Doreen Green (Squirrel Girl). Superpower: "The powers of a squirrel, the powers of a girl" (is acrobatic, strong, can fight, can talk to squirrels). Doreen is a totally empowered fangirl. She is a natural leader, confident and tough, but not innocent. Doreen is bouncy and energetic and her greatest quality is her optimism... She has faith in others and inspires people to believe in themselves. She also takes her pet squirrel, Tippy Toe, everywhere. Craig Hollis (Mister Immortal). Superpower: Cannot die. Ever. Maybe. So he says. The team troublemaker and lothario... Craig is kind of like "The Most Interesting Man Alive," except he's more cocky than confident and at times, charmingly grumpy. Although Craig's superpower seems amazing, he hasn't made use of it at all, he's lazy and figures if he has all the time in the world to learn how to fight, what's the rush? Dwayne Taylor (Night Thrasher). Superpower: None. Dwayne is a local celebrity "hero" with his very own YouTube channel. Brilliant, strong, noble, and maybe a bit full of himself, Dwayne is a shameless self-promoter and entrepreneur. But he also deeply believes in justice, at least his version of it. Dwayne hides the fact that he comes from a really rich family because he's afraid he'll lose his street cred. Robbie Baldwin (Speedball). Superpower: Can launch kinetic balls of energy. Robbie grew up watching Quinjets take off from Avengers Tower and loves the idea of being a hero. He's an impulsive and immature people-pleaser with a misplaced sense of confidence. Although you would think throwing kinetic balls of energy would be awesome and effective, his are completely out of control. Zack Smith (Microbe). Superpower: Can talk to germs. Zack is a shy hypochondriac whose ability nearly makes him a telepath, the germs tell him where you've been, what you ate and who you hung out with. It's impossible to keep secrets around him. He's a big sweet guy the team takes under their wing, and they help him find and grow his own confidence. Deborah Fields (Debrii). Superpower: Low level telekinetic; trickster. Deborah is proud, funny and quick witted. Confidently out as a lesbian, Deborah has experienced deep loss in her personal life as a direct result of super "heroics." She can take care of herself, or at least says she can. She's the one who calls people on their BS and has no fear of putting her opinions out there.